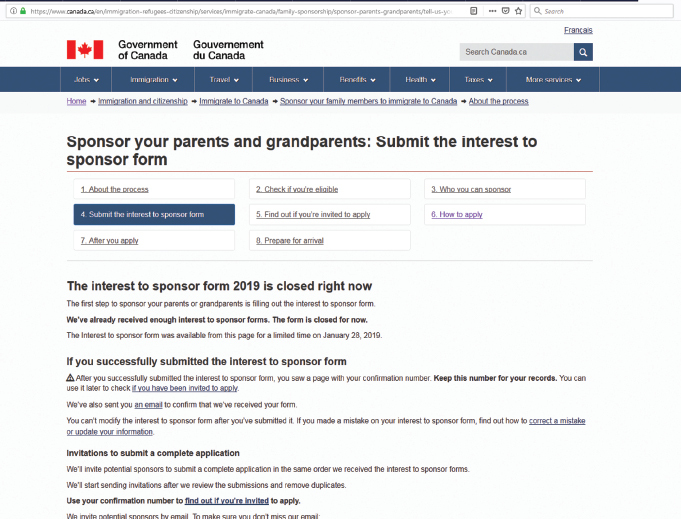 On January 11, 2019 -The Minister of Immigration, Refugees and Citizenship, the Honourable Ahmed Hussen, announced the Parents and Grandparents (PGP) Program interest to sponsor form will be available to potential sponsors starting at noon EST on January 28, 2019. The Minister stated, “Family reunification is an immigration priority for the Government of Canada. It supports Canada’s economic prosperity and it further strengthens our communities. Parents and grandparents often help care for children, increasing their parents’ ability to work and study, and to make meaningful contributions to their communities. In reuniting Canadian citizens and permanent residents with their parents and grandparents, not only do we help these families to succeed – doing so also benefits our entire country”. • In 2018, after removing duplicates, the department received 93,836 interest to sponsor forms. • Consistently high admissions levels for parents and grandparents over the last few years had allowed the government to eliminate the application backlog. The application inventory had dropped from a peak of 167,000 people in 2011, to just over 28,000 people in October 2018. The program however has not met the expectations of potential Sponsors. Within 11 minutes the online application reached its limits. More than 100,000 attempts were made and about 27000 applications went through. Upon the launch of the program, Hon. Michelle Rempel, Shadow Minister for Immigration, Refugees, and Citizenship said, “Justin Trudeau is misleading Canadians and newcomers when it comes to the Parent and Grandparent Sponsorship Program. All he has actually done is increase the number of applications to the program, without increasing the number of parents and grandparents that get permanent residence each year. Meanwhile, applicants showed their frustration over the process on social media networks. Rumease Siddiqui had no choice but to vent his frustration on his twitter handle. “This is ridiculous! Been waiting for years now... should have kept the portal open so people can at least apply and you can select first 20,000! Unlike shutting it down. I will be contacting my MPA for this. Irshad Osman Questioned whether if the program was legit. "Is today Parental sponsorship form Legit." For those who could not make it this year, their only hope is to try their luck next year.